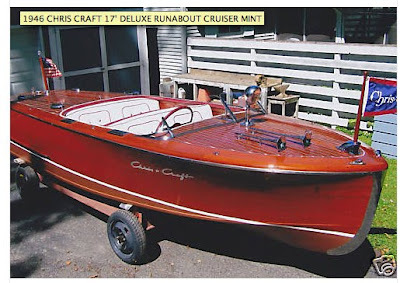 Rare Runabout Cruser. So Rare It May Not Even Exist! Thanks to the keen eye of Woody Boater Pete Devito he has found this very very very rare Runabout on eBay… So rare none of us have ever seen a runabout cruiser… But I am open minded in this hobby and realize that maybe I am no expert, because I am not…..I know you could get what ever you wanted if you asked…It claims to be original and never touched… Only two owners… mmmm OK… Someone ain’t telling the whole story here.. Click here and you can start your own museum… You can display it right next to the Brooklyn Bridge that you just got… Click here. Are You Preparing For Last Gasp Week? The Competition Is Already Getting Tough! Happy Fathers Day! It's Your Special Day Dad. Classic example of why to use a knowledgeable broker. Or maybe he bought it right after coming back from WWII. Took it to Tijuana for a little R&R. While he was there got the upholstery pimped, Racing red engine (good for that 1 extra HP), Chrome head nuts, Also left it out at night and the trailer walked away. I must admit, the wood and most of the hardware appear to be original although the lighter color covering boards and king plank are questionable. Now a red steering wheel with white detailing and a white interior with red detailing??? A RARE Herc. engine, RED??? First time I've heard the term "Runabout Cruiser". In my experience 90 percent of the people selling a wood boat are either in some state of denial or lie or just repeat whatever they have heard from someone else. Seeing is believing. Watch out for phrases such as, in good shape for its age, as far as I know, the boat has absolutely nothing wrong with it, and I dare you to find any rot on this boat. As in most things in commerce, BUYER BEWARE.